It’s finally here, after a long process of compiling and editing, writing and badgering: Not Seeing God: Atheism in the 21st Century. It has been particularly rewarding due to the fact that so many great writers have been involved in the production of this book. There are some 24 writers from the ranks of Patheos Nonreligious and they have all done their bit to make this project a really good looking, good feeling, and intellectually stimulating affair. There is a great variety of writing and subject matter on offer, here, with the first section (Part One: DECONSTRUCTING GOD) dealing with philosophical, moral and theological issues with the God concept. The second section (Part Two: REFLECTING ON GODLESSNESS IN MODERN SOCIETY), deals with atheism within various contexts in modern society, from cinema to the military, politics to education. The final piece of the puzzle (Part Three: LOOKING TOWARD A FUTURE IN A GODLESS WORLD) asks the reader where we go from here, and seeks to give a few answers. Please click on the link above or the cover to grab yourself a copy (UK link here). Ebook formats are to follow before Christmas (all formats: Onus Books, 2017). Atheism is an evolving worldview – not the single proposition that God does not exist, but everything else that might or might not go with it. With only a single sentence about the existence of single entity, there is huge scope – necessity, even – for having to reasonably work everything else out. It’s a lot more difficult to figure out the world when it’s not handed to you in an old, outdated book. The world is sometimes a complicated place. With this in mind, Not Seeing God looks at the challenges of leaving religion, arguing for atheism, the role and position of atheism in society and where we go from here. This anthology of chapters from the writers of Patheos Nonreligious is a cornucopia of skeptical delights and is a necessary addition to any nonbeliever’s bookshelf, as well as that of the questioning believer. From philosophy to psychology, politics to cinema, the military to folklore, it’s all here in glorious variety, at the crossroad of atheism and society. 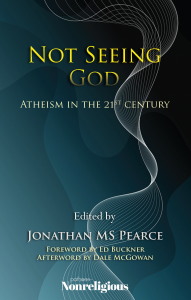 Not Seeing God is a concentrated blend of the classical and contemporary arguments against religious dogma from some of today’s most popular philosophical thinkers comprising rapid fire rationality sprinkled with clarity, wisdom and cutting wit. A thoroughly entertaining read that will undoubtedly rattle the cages of dogmatic certainty. Not Seeing God is an excellent collection of some of the best skeptical writers working today. As one would expect from the writers at Patheos Nonreligious, each piece is well crafted, often humorous, occasionally moving, and always deeply insightful. The quality and diversity of writers and their approaches to not seeing god(s) makes this text a handy reference tool for the next time you find yourself embroiled in a formal debate on the existence of God, or a conversation with a cantankerous relative at a family reunion, or even (OmniGod forbid) a Facebook argument. From defeating Pascal’s Wager (see “Using Common Sense to Not See God” by Bob Seidensticker), to navigating the waters of raising your kids in a religion-soaked world (see “Not Seeing God when Raising your Kids” by Stephanie Savage) this book has so much to offer that I suspect it’ll spend a lot more time sitting on my desk than it will on a shelf.